Believe it or not, when I finish a project I can hardly wait to get to the left over scraps so I can cut them up. I cut them into whatever sizes I can get from the fabric remnants. It’s a lot of fun and amazing how the fabrics take on a whole new look when you change the size of them. Suddenly a whole new project can emerge from the leftovers and I know they are fabrics I already liked. 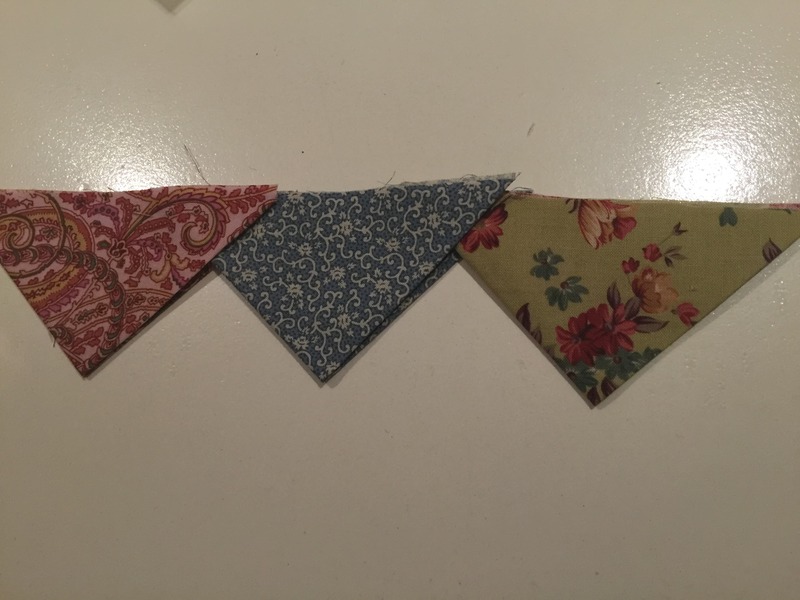 So I found myself with quite a few left over 3 1/2″ squares of mixed florals and some irregular triangles. This is what I came up with. 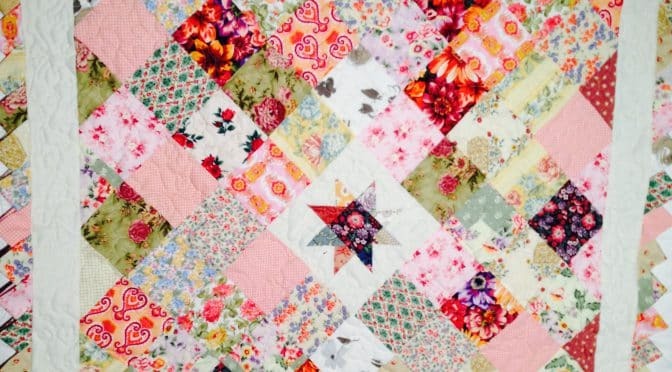 This pretty baby quilt has an easy method of construction. A little star surrounded by pretty florals. It’s another good idea for using up some scraps of fabric. It has Praire Points around the edge. I really enjoyed making this little quilt. Maybe you can make this quilt for a Little Star in your life! To make the centre Star block please see tutorial on Foundation Triangles. Once the star points are made. Piece the block together like a nine patch. Ensuring even colour distribution, separate the 3 1/2″ squares into two groups of 68 squares each. Sew together 17 X 4 patch units from one set of the 68 squares. Ensure no two same fabrics are next to each other. Stitch a four patch unit to two opposite sides of the star block. Press. Stitch a row of three four patches together. Repeat. Pin and sew these two rows to the remaining two opposite sides of the star block, ensuring that the seams are nested and lining up. Press. Use the remaining 9 x four patches and sew them together to make a nine patch. Now you should have two blocks. One with the star in the centre and one with just the 36 squares. Press the blocks. Leaving the star block aside, take the block of 36 squares only and carefully slice or cut across both diagonals to reveal 4 triangles. Now take the four triangles and carefully pin the long side (the hypotenuse) of two triangles to two opposite sides of the star block matching the seams. Then sew the remainder two triangles to the other two sides of the star block. Now your quilt is set on point! 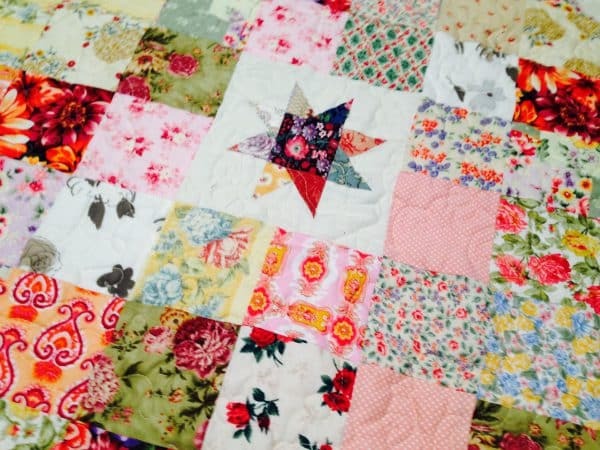 At this point, handle the quilt edges with care as they are on the bias. Secure the edge by stay stitching 1/4″ from the edge of the quilt all the way around the outside. Use a large stitch length. Do not stretch the fabric. 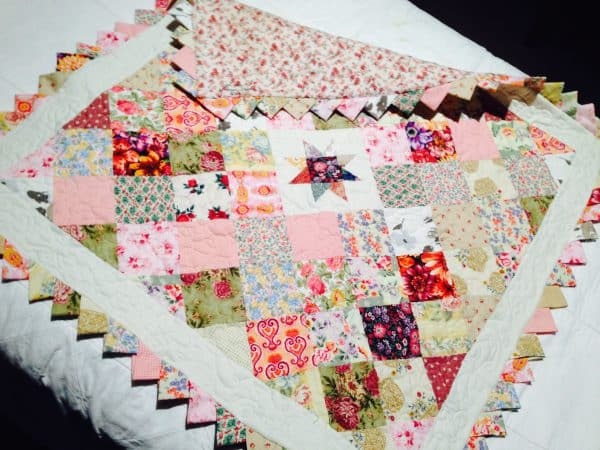 Measure through the centre of the quilt to determine border lengths. Use the cream homespun 2 1/2″ strips to attach a border to the perimeter of the quilt. Make sure the quilt edges are not stretched. Do not press until all the border sides are added. Now take the other set of 68 squares. Take them to your ironing board and carefully press them in half along the diagonal, then in half again to make 68 folded triangles. 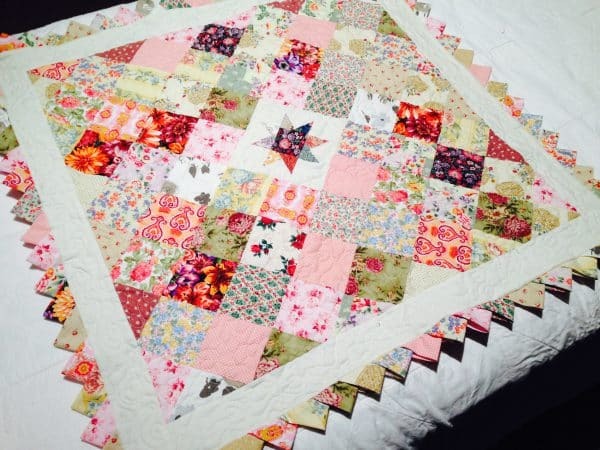 Attach 17 triangles to each side of the front of the quilt. The triangles should overlap slightly and sandwich into each other as they are placed. The raw edge of the triangles should match up with the raw edge of the cream border. Take some time to make sure they are as even as possible in placement and colour. 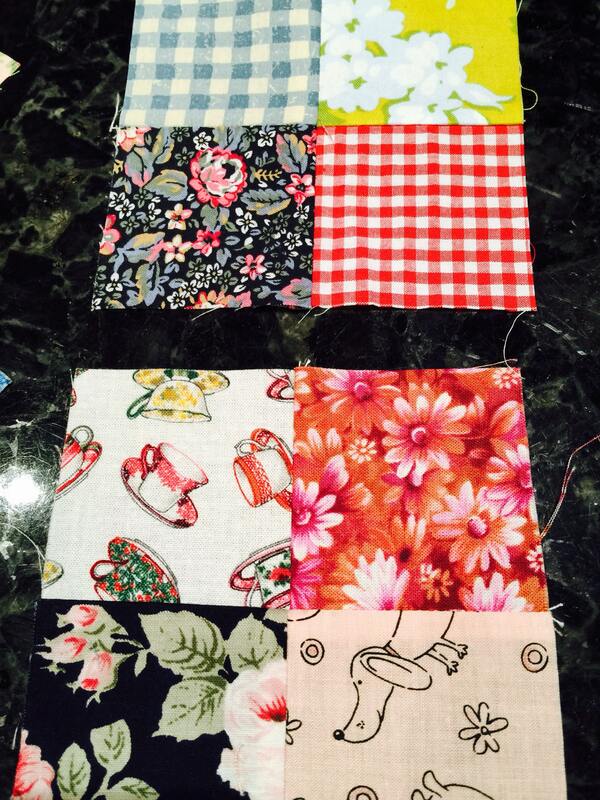 Once you are happy with the placement stitch them down to the border edge using a quarter inch seam allowance. Press them back to reveal the lovely Praire Points border. Ensure the backing and batting is larger than the quilt. 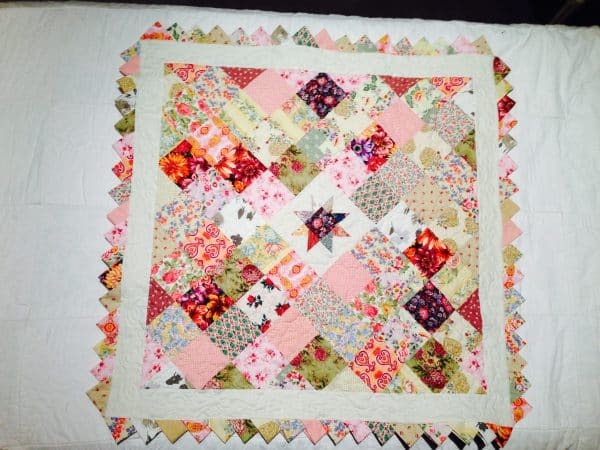 Quilt as desired, but, do not quilt right to the edge leave about a half inch distance around the perimeter of the cream border. 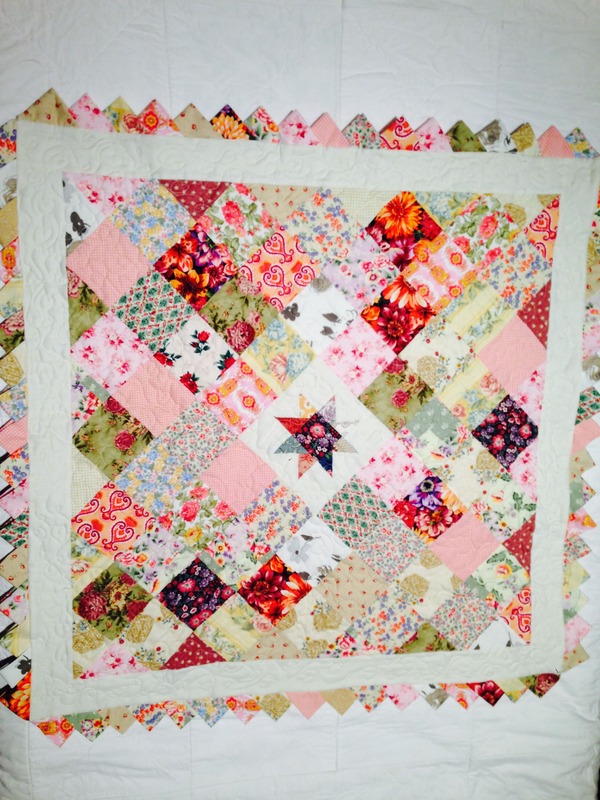 I quilted this little quilt with hearts and loops. Once the quilting is completed turn the quilt over and careful trim the batting to match the quilt edge. Be careful not the cut the quilt or backing. 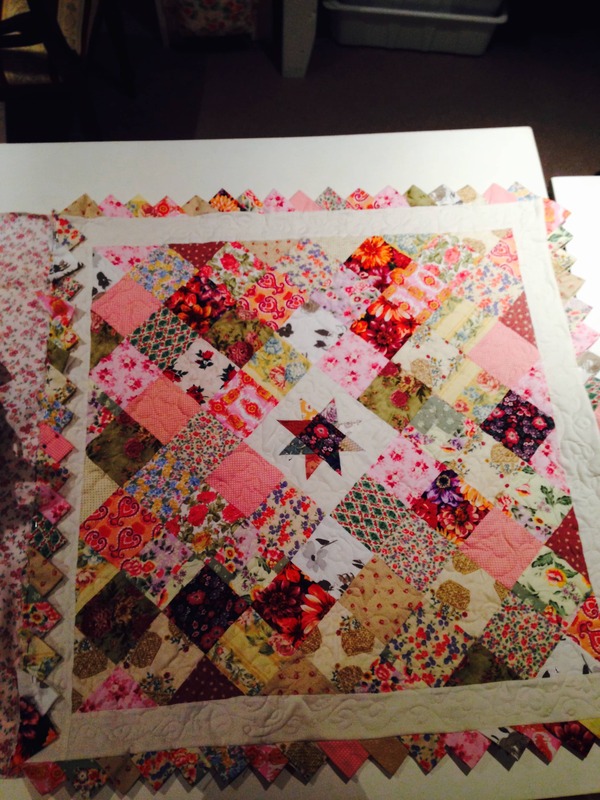 Now trim the backing so that it is approximately 12″ larger than the quilt edge. Fold in the backing over the batting edge so that it lines up with the edge of the quilt. Pin and hand stitch all the way around the edge. Love you ideas for scrappy star quilt, thanks for sharing your tutorials.